Routh's Atom (along with Heat Wave and Captain Cold) will do double duty on Legends and The Flash. Get ready for a Rip roarin’ time! In DC Comics’ next TV adventure, time-traveling genius Rip Hunter is rounding up a roster of the good, the bad, and the gorgeous to save the world. And you already know most of them. “In our minds, it’s the first modern-day superhero team-up show,” explains executive producer Greg Berlanti, who, along with his Arrow and Flash brain trust (Marc Guggenheim and Andrew Kreisberg), has created DC’s Legends of Tomorrow. The splashy new spinoff follows Hunter (Doctor Who’s Arthur Darvill), an inventor from the future, as he recruits a roster of familiar faces from the trio’s existing CW hits. Leading the team is Hunter, a character created by the late, great Jack Kirby back in 1959—and he’s got his work cut out for him. “The [fun] of this show is watching how all of these completely different heroes and villains will interact with each other,” Guggenheim says of the brewing clash of comics titans. “Hawkgirl has all manner of issues because of her past lives [a thread from the comics], White Canary will be dealing with the ramifications of her resurrection [thanks to the Lazarus Pit], and Dr. Stein has his own problems to deal with. We find out that he used to be Ray Palmer’s professor…and they kind of hate each other.” For now, producers are mum on the whereabouts of Ronnie Raymond (Robbie Amell), Firestorm’s other half. 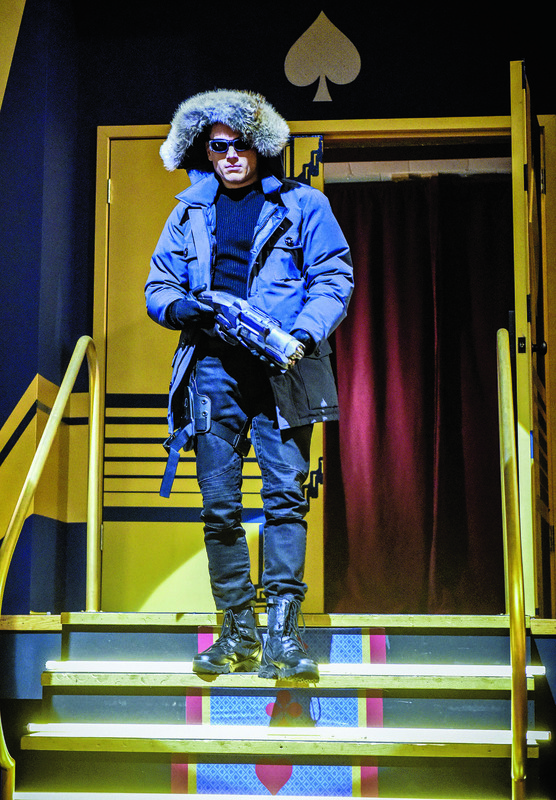 They had all better learn how to play nice, because Hunter—the original designer of the time sphere used by Eobard Thawne (Tom Cavanagh) in The Flash’s season finale—needs them to bring down one of DC Comics’ greatest supervillains. “The fall season is very much going to be a buildup to this,” says Berlanti, explaining how a Flash-Arrow crossover planned for late this year will tee up Legends’ midseason launch. Envisioned as a 13-part anthology (“Each season should feel like its own movie,” Guggenheim says), the first self-contained storyline will focus on the kickass collective’s crusade against Vandal Savage, an immortal who has taken over the world in the future. The character has a legacy of more than 70 years in the DC Comics universe. Lotz topped the Legends wish list, Kreisberg says. "When we were thinking who should be on the roster, it was like, 'Hey, what if we brought Sara back to life?'" And despite their increased workload, these characters are not abandoning Starling and Central Cities altogether. That said, Berlanti promises “each show will stand on its own,” so fans won’t need to follow Legends, Arrow, and The Flash at the same time. But those who do will be treated to plenty of surprises.